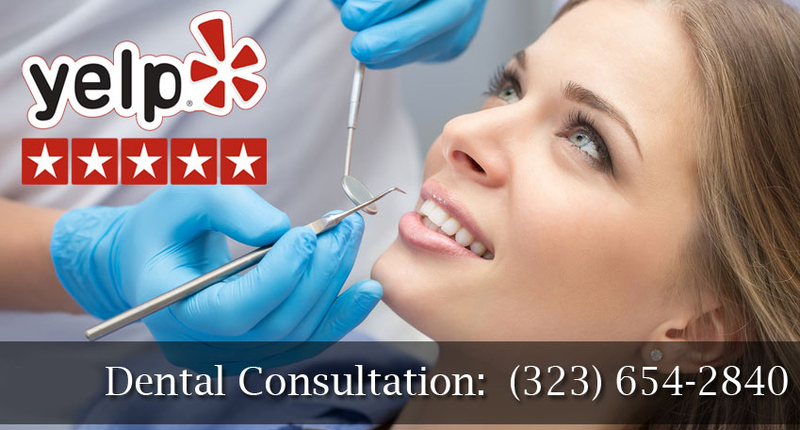 Holistic dentistry of West Hollywood Holistic and Cosmetic Dental Care is the highest quality of dentistry provided with your whole body wellness in mind. Dr. Bruce Vafa and the rest of the West Hollywood holistic dental team work hard to remain among the top providers in their field, right here near your home. Holistic dentistry is a modern practice of dental care that treats each patient's teeth, gums and other oral structures for their best health, while also considering how these are part of the body's overall wellness. When diagnosing and treating oral disease and structural issues of the mouth, your holistic dentist will perform his work using non-toxic materials and the least invasive and stressful procedures possible. The dentist also partners with other top professionals in their field for your treatment, when this is needed for services West Hollywood Holistic and Cosmetic Dental Care does not provide. In a nutshell, holistic dentistry is collaborative treatment oriented to your whole body's long-term good health. The term "holistic" is not just related to the practices and techniques your dentist uses. More, it is an overall philosophy. The dental services you will receive are based upon that philosophy of whole-body good health, education of patients regarding their health and connection of dentistry to a healthy future. All dentists understand that the mouth and its structures are related to the rest of the body's wellness. But many dentists fall short of being trained in dentistry's long term effects on the body. Dentists who are truly holistic have been trained to practice dentistry with a focus on the whole body, not just teeth and gums. This holistic approach does not just include absence of mercury fillings in your treatment plan. Instead, your holistic dentist looks at your entire head, face and neck when developing treatment plans, considering how those parts must work together for your healthiest and longest life. Going to a new dentist may be stressful to you, as it is to many patients. So you need a dental care team who understand how stress can negatively affect your overall wellness. You need dental care that is as stress-free as possible, while also being as safe as it can be for your body. After your first visits at West Hollywood Dental and Cosmetic Dental Care, you will have far less stress in knowing that Dr. Vafa and his team consider your wellness a top priority. Holistic dentists know more today than ever before about how your oral health affects your body. Research ties oral health and gum disease to heart disease, diabetes, issues of pregnancy, inflammatory diseases, obesity and dementia. When your teeth are not properly aligned or are missing, your oral malfunctioning can lead to TMJ disorders, as well. Your holistic dentist Dr. Vafa performs treatments designed to ensure the best health of your teeth, gums and entire mouth. This is done using techniques and tools that help prevent greater health risks associated with poor oral health. Treatments are also conducted in ways that prevent stress and help you remain at ease during your dental visit. Dr. Vafa and his team always consult fully with you about your treatments before they are performed, ensuring you understand the procedures and options for your dental care. All of this is done to not just help your health and appearance today, but for long-term good health long into your tomorrows. When you visit with your dentist of West Hollywood Holistic and Cosmetic Dental Care, you will be provided with a plan for your healthiest dental future. Your dentist will work to correct problems that exist in your oral structures and tissues, just as he works to maintain the wellness of what is already healthy in your mouth. In traditional dentistry that does not include a holistic approach, mercury amalgam fillings are used due to their longevity and ease of coverage by your insurance company. In other words, these are the most cost-effective fillings that last a long time. When using mercury fillings, your dentist will affirm that the ADA and FDA have rated mercury fillings as stable in the body and safe for oral healthcare. These fillings are also easy for your dentist to craft. But holistic dentists know that mercury – despite being labeled as "safe" is still a toxin. Even tiny amounts of this metal are a risk for your long-term health. Amalgam fillings made of mercury last longer than other types of fillings, yes. But these fillings also stress your teeth and cause them to weaken. So it then becomes an issue of how the mercury filling break down your teeth, then outlasting your natural tooth structure. Your holistic dentist will likely recommend using composite fillings, instead of mercury ones. There are many circumstances under which your holistic dental care team will recommend removal of old mercury fillings to replace them with safer material. Health benefits are not the only reason why these fillings are replaced. They can also be replaced by more attractive, tooth-colored fillings that are non-detectable and keep you in good health, at the same time. Root canal therapy is a method of saving a severely decayed tooth that is dying or has already died. This is a procedure that has been performed for centuries. It can keep a natural tooth in place and functioning as you need it to, without requiring extraction and replacement. When conducting a root canal, holistic dentists like Dr. Vafa know that they must ensure 100 percent sterilization and bacteria removal for the therapy to be fully effective. But these dentists also know that this is extremely difficult to perform holistically, as sterilizing chemicals are toxic to the body and leftover bacteria can harm your health in the long run. In fact, many studies have linked diseases like breast cancer, heart disease and other maladies to oral bacteria like that found in a root canal. This is why your holistic dentist will try to avoid root canal therapy, whenever that is possible. Root canal therapy will be fully discussed with you by your holistic dentist, when you have a dying or dead tooth. There are alternative methods of returning optimal functioning and appearance to your mouth, outside of root canal. These are options that can be easily discussed with your West Hollywood cosmetic dentist. Fluoride is often recommended by traditional dentists, both in toothpaste and drinking water. This is why many communities across the U.S. have fluoridated water in the tap. Infants are often prescribed fluoride drops. This is all done in reference to lower cavity rates of communities where water is fluoridated. Holistic dentists do not think the same on the subject of fluoride. They point to research linking ingested fluoride, such as through water, to health problems like cancer. Other research indicates no actual benefit of fluoride in the water. Another issue to consider is that too much fluoride leads to fluorosis, while politically speaking, fluoridation of public water supply is forced medication of the public without their consent. Your holistic dentist may or may not recommend use of topical fluoride. In topical form, the fluoride is not as invasive and primarily reaches teeth and oral tissues. Fluoride may be something you wish to discuss with your West Hollywood holistic dentist. Holistic dentists understand that what goes into your mouth does affect your overall health. Your holistic dentist may conduct biocompatibility testing to ensure there are no reactions by your body to the materials used in your oral healthcare. This biocompatibility may come into effect for procedures like fillings, bridges, crowns or other treatments. When you are a patient of West Hollywood Holistic and Cosmetic Dental Care, you are treated with the utmost respect and dignity for the whole being that you are today and hope to be in the future. Dr. Vafa and his dental team use the latest technology designed for your wellness. Digital imaging reduces your exposure to radiation, safe composite fillings keep you safe from mercury risks, and other treatment methods and materials are used with long-term wellness in mind.